In recent years, Low-Power Wide-Area Network (LPWAN) technologies have emerged as a viable alternative to traditional wireless technologies to provide power-efficient and cost-effective wide area connectivity for the IoT. As the number of connected IoT devices grows from 7B in 2018 to 22B in 2025, LPWANs are expected to be a key growth driver. 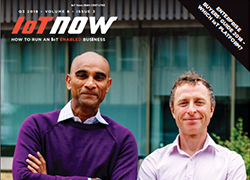 In a recent market report including comprehensive analysis of LPWAN, IoT Analytics estimates that LPWAN will be the fastest growing IoT communication technology over the next 5 years, with the number of LPWAN connected devices growing 109% per year and forecast to exceed the 1 billion mark in 2023. LPWAN market remains fragmented, but LoRa and NB-IoT are emerging as the two leading technologies. Today the LPWAN market is still at an early phase and characterized by a high degree of technological fragmentation (IoT Analytics investigated 16 LPWAN technologies, and there are even more out there) and a network footprint that is far from being global. However, the analysis of the market suggests this is quickly consolidating around a few key technologies. According to the estimates, in 2017 LoRa was the overall market leader if both public and private network deployments are counted, while Sigfox was leading in terms of connections via public networks, with the vast majority concentrated within Europe. 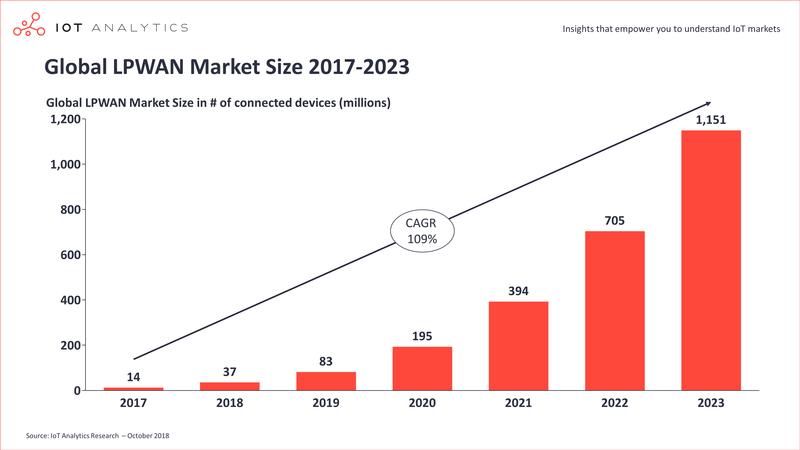 However, the situation is likely to change by the end of 2018, when the fast-growing NB-IoT technology is expected to surpass both LoRa and Sigfox in terms of connected devices – becoming the dominant LPWAN technology for the rest of the forecast period 2018-2023. LoRa on the other end will maintain its leadership for private network deployment. Counting both public and private networks, NB-IoT and LoRa already make up about 70% of the market today and are expected to grow their share of the market to almost 85% within the next 5 years. Cellular MNOs are increasingly betting on multiple LPWAN technologies to address a wider range of use cases and application scenarios. The market analysis also highlights a few emerging trends, one of the most interesting ones being the support of multiple LPWAN technologies by the same network operator within the same area. Technically, each LPWAN technology is characterized by a different set of features that makes each of them best suited to a different range of IoT use cases and application scenarios. Deploying IoT networks with different technologies that complement each other provides operators with the means to accommodate a wider range of customer requirements. While at the same time it allows them to differentiate their investment and reduce the risks of one of the deployed technologies not experiencing the device volumes that were initially anticipated. Out of the 52 cellular MNOs who have already launched commercial LPWA networks, 10 have adopted this multi-technology strategy. According to GSMA, 8 cellular MNOs had already deployed NB-IoT and LTE-M networks over the same country by September 2018, the majority of which are in the Asia-Pacific region. More have announced plans to do so in 2019, e.g. AT&T and Verizon. At the same time, 2 more operators (KPN and SK Telekom) launched both a licensed and an unlicensed network in the same country, specifically LTE-M and LoRaWAN. Furthermore, recent marketing messages from different suppliers of LoRaWAN products and/or services (e.g. Actility, Orange) suggest that LoRaWAN and licensed technologies are highly complementary and are thus being increasingly combined together in solution deployments. Many industry experts had already pointed out in the past that a multi-technological strategy would be key for the success of the LPWAN market, as no single LPWAN technology can cover all potential use cases. It seems MNOs have now come to the same conclusion and are getting ready to support multiple LPWAN technologies. The insights presented here were derived from the comprehensive 260 – page LPWAN Market Report 2018-2023. The report focuses on the technical features, ecosystem and SWOT analysis of 7 leading LPWAN technologies (plus 16 other relevant technologies), examines their suitability for 37 IoT uses cases, forecasts the market outlook to 2023 and includes much more.